Full Description: One of a series of large black and white photographs of Tommy Williams, taken in the mid-1970s by Les Davies in Tommy's top floor attic workshop at 74 Tennyson Street, Battersea. Tommy Williams was a Lachenal craftsman/tuner in the 1920s, and was interviewed and recorded for a Free Reed label LP by Neil Wayne and Nic Kinsey in 1975; those recordings are now available on the Free Reed CD "Masters of the Concertina" FRRR 12, available at www.free-reed.co.uk/frrr12 . 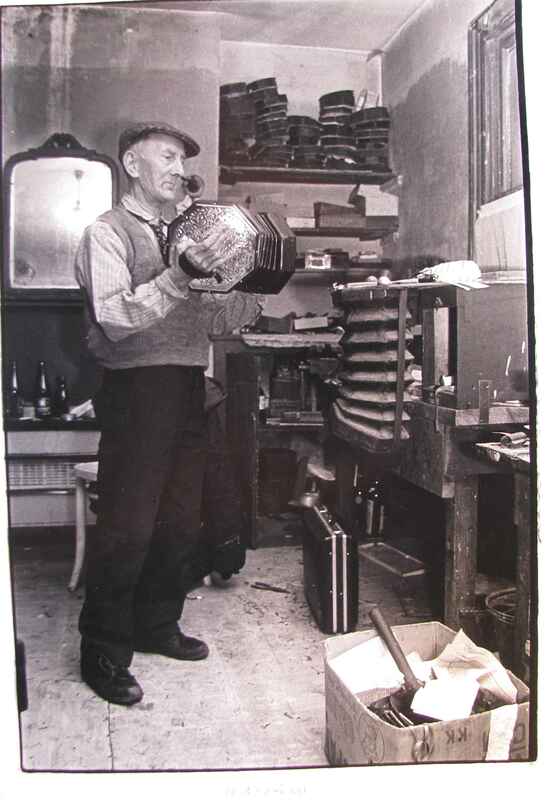 The images show Tommy playing, smoking his pipe, tuning reeds and seated amid the rather chaotic workshop room. This one features Tommy with duet, standing in his workshop, with shelving and tuning bellows nearby.